When doing research for another post, I discovered David Gershon’s Journey for the Planet: A Kid’s Five Week Adventure to Create an Earth-friendly Life. I wondered what children would be encouraged to do and how this compared to other books providing “eco tips” for young people. This book is unique, as it creates a game for the children to play alone or in teams as they implement actions as part of the climate change solution. You are about to go on an amazing journey-one that will help you and the planet. It will be fun, challenging, and exciting. Over a five week period you will learn how to take action to use our Earth’s precious and limited natural resources with greater care. Watch Out Planet, Here I Come! Bringing your own container for leftovers at a restaurant rather than accepting a “doggie” bag. Using a cup of water when brushing your teeth rather than running the tap water. Become a loaner and let friends borrow toys, books, etc. I like how this book gives children choices and does not expect them to complete all of the actions. I also like how children earn points, thus making a game out of it which could easily be adapted for the classroom. 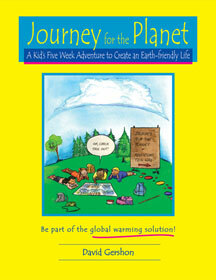 Journey for the Planet is a kid-friendly book published by the Empowerment Institute.